I want to share a classroom project that emerged from the interest of three and four year olds. 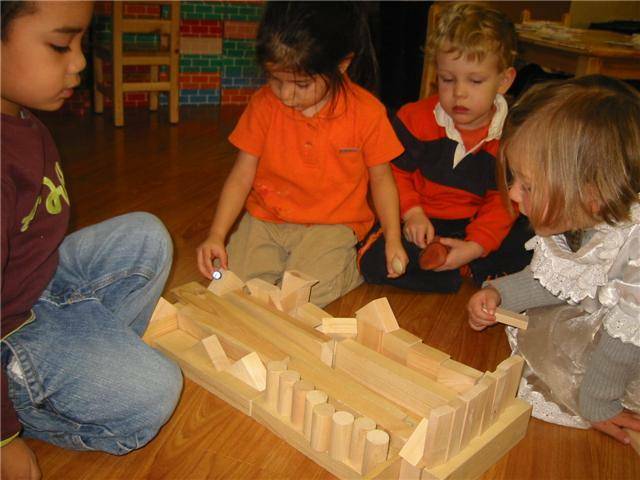 In classrooms equipped with blocks, children spontaneously create ramps, or inclined planes. In Pre-K 202, teachers spent an entire school year supporting children’s interests in ramp investigations; nurturing their logical-mathematical and spatial intelligences. The story you will hear took place in my classroom at Ivy Academy in 2006-07. 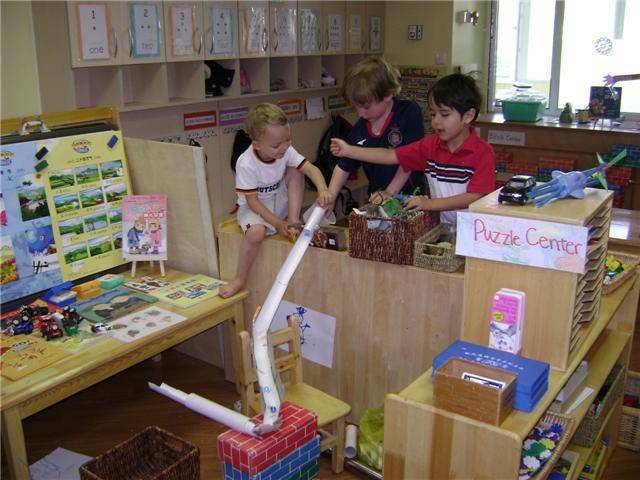 When children are allowed long blocks of time and the freedom to choose what they want to do, the relationship between play and scientific investigations becomes obvious. One day, in late fall, I noticed children sending small cars down a ramp they had constructed in the Block Center. Sometimes they would just let the cars go, and sometimes they would give them a push. They discovered that the cars would travel farther off the ramp if they gave them a push. That weekend, I went shopping and bought some marbles. I put them in a small basket in the Block Center. I knew children had discovered the marbles when I heard squeals of joy and saw marbles rolling every which way across the classroom floor. I approached this busy group of inventers and told them that I though they had a great idea – building a ramp for marbles. But, I told them, we can’t have marbles rolling all over the classroom. I invited them to sit down and think together about how they might contain them. I learned so much about each child as I listened to them express their ideas. I watched as they listened to each other. I was in awe as I heard each one of them make suggestions and take suggestions from the others. The question on the table was not what to build – they would build “sides and a fence” – but rather what materials to use. One thought she could make a fence out of recycled materials from the Art and Construction Center. Another thought they could use our large cardboard blocks. Eventually, they settled on the wooden blocks. Finally, they got busy building sides to “bank” the marbles, and a fence to contain them. Once built, it was time to test their idea for containment. They were now experimenting with cause and effect. At a Circle Time later in the day, I invited the ramp builders to share their invention with the rest of their classmates. We wandered over to where it had been saved, and they talked about discovering the marbles, and marbles everywhere. At this point, I could see that experimenting with inclined planes could be a long-term, high-interest project, as it seemed to capture the imaginations of all who were listening to the presentation. The next step involved sitting down with the whole class. I wanted to find out what my children knew about ramps; if anyone had ever seen them in the real world; how they thought ramps assisted human beings in accomplishing goals at work and play. I wanted them to think of their own experiences with inclined planes (sliding down a slide or sledding down a hill), and I wanted them to think of other ramp building materials we might have in our classroom besides blocks. Based on some of the ideas they had about building materials, I asked our resource teacher if she would be willing to work with children on this project over several days. On the first day, they used paper towel rolls, scissors and tape to construct a pathway 120 cm. long. Once constructed, Melanie introduced several objects of various shapes, sizes, and weights. She led them in an inquiry-based discussion, inviting them to predict which of the objects would move most quickly down the path to the floor, and why. They then tested their ideas, talked about what they observed, and offered explanations. Three year old Mael told Melanie his good idea for constructing a curve. And I have to tell you, it was brilliant. Mael had figured out (in his mind) that “We can cut lines on both sides of a short piece of a half tube, and when we pull it in to a curve, it will have triangles spaces, and then we can cut out triangles of the same size and tape them over the spaces…” This is one of those situations where a child can think of something to do, but can’t actually do it alone. Again, teacher and child as co-learners. Melanie attached the curve, and the next thing that happened surprised us all. The marbles flew off as soon as they hit the curve. They decided they needed to “bank” it (a concept they learned in their earlier explorations in the Block Center), and they needed to support the incline at the curve. They used a chair for this, and then it was Clean Up Time. We created a barrier and a sign to protect this “work in progress” which sent a powerful message – your interests are important to us, and we take your work seriously. Experimenting with inclined planes convinced me of the proposition that all children are natural-born investigators. It was very exciting watching children in Pre-k 202 construct their own knowledge base, acquire new vocabulary, and use their thinking skills to ask questions, investigate and create.